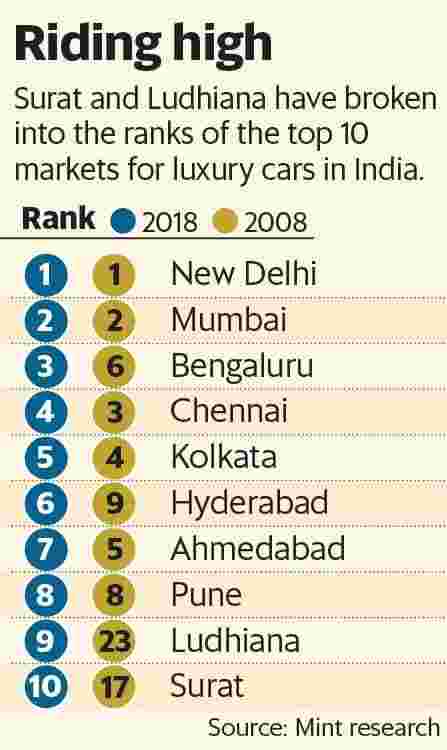 Mumbai: Smaller cities such as Surat and Ludhiana have broken into the ranks of the top 10 markets for luxury cars in India in the past decade as economic expansion spawns an emerging class of young, successful entrepreneurs who aspire to showcase their growing wealth. Mumbai and Delhi retained their places as the top markets for brands such as Mercedes-Benz, BMW and Audi although their share has declined in the overall pie, according to senior executives at the car companies. Overall, luxury car sales have grown at a fast clip in the past year and a half despite unfavourable increases in taxes and import duties. Sales of the top three car makers in the category climbed by about 20% to more than 33,600 units in 2017. In the first half of 2018, sales of market leader Mercedes-Benz India Pvt. Ltd rose 12% to 8,061 vehicles. BMW India Pvt. Ltd posted a 13% increase to 5,171 units of its BMW and Mini brands. Tier-II and tier-III markets are helping drive this sales expansion at par with the metros, if not more, according to auto makers. “We see strong contribution coming from established markets like Delhi NCR, Mumbai, among others," Vikram Pawah, president of BMW Group India, said via email. “At the same time, emerging markets in tier-II and tier-III cities have grown rapidly and are showing remarkable growth prospects for the future." In tandem with a customer base that has “evolved tremendously" over the past decade, Pawah said young achievers from relatively smaller cities, who “have a global outlook, are well-travelled and have an eye for luxury products" will “actively shape demand for the luxury car market" in the coming years. Sagar Agarwal, a 24-year-old businessman from Surat, purchased his first luxury car, a Volvo XC40, last week. Though his joint business family owns two other Volvos and a Mercedes E-Class sedan, Agarwal was prompted to make the purchase by the success of his recently established fabric exporting company. The car symbolizes his achievements, and would serve well as a “status symbol" in business circles, he said. other mass cars I had driven before." He added that he would want to buy more luxury cars as his income grows in the future. Broadly, India’s luxury car market has ample headroom to grow. Kotak Wealth Management said earlier this year that ultra high net worth households (those with a minimum net worth of over ₹ 25 crore) are expected to double to 330,400 by 2022. Indians are getting wealthier at a younger age as about 60% of individuals surveyed were below 40 years as against 47% interviewed a year earlier, Kotak said in a report. To be sure, this shift is not uniform for all luxury car makers. Mercedes-Benz has not witnessed any shift in its top 10 markets over the past five years, according to chief executive and managing director Roland Folger. However, the contribution from Mumbai and Delhi has fallen to about 45% recently from close to 70% in 2009-10, said an executive on condition of anonymity. “Apart from the top 10 cities, others contribute a marginal 10%", he added. However, analysts say the next wave of growth will come from untapped cities, as the addressable market in the metros has reached a saturation level for luxury cars. They “must cater to cities with a population of 500,000 and above, as the propensity to spend in smaller commercial centres such as Kota and Kochi increases", said Anil Sharma, associate director at MarketsandMarkets, a researcher. He said the proliferation of luxury car companies “is very strong in the metros, so the addressable market there has already been serviced."